Júlia Ferrer successfully presented her final Degree in Physics project, devoted to the set-up of a dynamic optical tweezers system including acousto-optic deflectors. Júlia was granted to pursue the 2-year Erasmus Mundus Joint Master Degree in Photonics. Good luck Júlia, hope to have you back soon! We are glad to know that we have been granted for the next 3 years by the Spanish Ministry of Economy and Competitiveness, under the research project "Medida de fuerzas y reología en el interior de células vivas mediante laser tweezers" (FIS2014-60052-R). Arnau and Ferran leave to attend the 2015 OSA Biomedical Optics & Photonics Congress: Optics in the Life Sciences, Optical Trapping Applications (12-15 April), to be held in Vancouver (Canada). Arnau will give an invited talk to present our last results on force measurements in complex samples. Estela, Arnau and Ferran attended the great conference Trends in Optical Micromanipulation III (25-30 January). They had a very productive week sharing our results on force measurements on non-spherical particles trapped with non-Gaussian beams and suspended in non-homogeneous media. They had some free time for skiing, too! The Impetux team was interviewed at the newspaper La Vanguardia (in catalan). Some good news just before Christmas... again, after a fruitful collaboration with prof. Jochen Guck's group, a paper has been accepted for publication: “A monolithic glass chip for active single-cell sorting based on mechanical phenotyping”. It is available on line in Lab on a Chip. Two new undergraduate students join the group to do their final Degree in Physics project: Rafa Perpiñán and Júlia Ferrer. Welcome! The paper “Dynamic operation of optical fibres beyond single-mode regime facilitates the orientation of biological cells” is now available on line in Nature Communications. Dorian Treptow finally presented his German diploma thesis ("Video-based calibration of holographic optical traps"), supervised in Barcelona by Mario Montes-Usategui and Estela Martín-Badosa, and by prof. Norbert Fruehauf in the University of Stuttgart. We are glad to announce that, after a collaboration with the group led by prof. Jochen Guck at the Cavendish Laboratory, University of Cambridge (currently at the Biotechnology Center, Technische Universität Dresden, Germany), the paper “Dynamic operation of optical fibres beyond single-mode regime facilitates the orientation of biological cells”, has now been accepted for publication in Nature Communications. The review paper "The measurement of light momentum shines the path towards the cell", by A. Farré, E. Martín-Badosa, and M. Montes-Usategui, is now available on line. It is finally official: Arnau Farre's thesis has been awarded with the Extraordinary prize for the best thesis in Applied Physics of the course 2012-2013. Congratulations again, Arnau! Noemí Domínguez successfully defended her master thesis, entitled "Measurement of holographic trap positioning". Congratulations, and good luck in your next placement! Arnau attended the 23rd Congress of the International Commission for Optics (ICO), where he received his Justiniano Casas second prize for his thesis, entitled "Momentum measurements of single-beam traps and quantitative holographic experiments: two sides of the same coin". Congratulations again! You can read this news in the SECPho webpage. Mario, Arnau, Ferran and Frederic attended the SPIE Optical Trapping and Optical Micromanipulation XI conference (17-21 August) to present our last results on force measurement from the changes in light momentum, and its use on irregular samples and for the study of in vivo trapped organelles. Undergraduate call: there is an open call (deadline 15 September) of the Spanish Ministry of Education, Culture and Sports for undergraduate students who would like to pursue some work in a research group. You can find the call details here. If you are interested, please contact Estela Martín Badosa. An animated image from our paper “Artificially-induced organelles are optimal targets for optical trapping experiments in living cells” has been chosen as the cover illustration for the July 1 issue of Biomedical Optics Express. We are really glad to announce that Frederic Català has been awarded with a 4-year grant from the Spanish Ministry of Education, Culture and Sport to pursue his PhD studies. You deserved it, Frede! Our patent "Method for manipulating microscopic samples and measuring forces acting thereon" has been finally granted (30 June, publication number ES 2395496). Arnau Farré has been awarded with the Justiniano Casas second prize for research in Optical Imaging, 4th edition, for his thesis, entitled "Momentum measurements of single-beam traps and quantitative holographic experiments: two sides of the same coin". The award ceremony will be held on the 29 of August in Santiago de Compostela during the meeting of the 23rd Congress of the International Commission for Optics (ICO). Congratulations! On June 25th Astrid Ribot defended her final Degree in Physics project, entitled "Beam steering with spatial light modulators: Quantisation effects". Excellent Astrid! Frederic Català and Estela Martín Badosa have attended the 6th meeting of the Institute of Nanoscience and Nanotechnology of the Universitat de Barcelona (6 June), and presented the work "Force measurements on irregular samples with holographic optical tweezers". Together with other students of the Master in Photonics, Noemí Domínguez has won the second edition of the SECPhO Photonics Innovation Award, for their project Tueris, in which optical tweezers are applied to in vitro fertilization. Congratulations to all the team! Our paper "Artificially-induced organelles are optimal targets for optical trapping experiments in living cells" has been accepted for publication in Biomedical Optics Express. From now on we are an officially recognised Research Group (2014 SGR 807) by the Generalitat de Catalunya. The paper "Holographic optical tweezers combined with back-focal-plane displacement detection" has been selected in Virtual Journal for Biomedical Optics. We welcome Noemí Domínguez as a new MSc student (Master in Photonics). She will be working on holographic optical trap positioning. Our paper "Holographic optical tweezers combined with back-focal-plane displacement detection" is now available on-line. Our paper "Holographic optical tweezers combined with back-focal-plane displacement detection" has been accepted for publication in Optics Express. A call for Beques de col·laboració amb Departaments for undergraduate students or master students is now open (due date: 30 September). Frederic Català brilliantly defended his master thesis work, entitled "Beam steering accuracy in holographic optical tweezers" (10 September, Master in Photonics). Congratulations! Frederic Català is attending the International Nanoscience Student Conference (INASCON'2013) in London (19-22 August) to present his work on the analysis and improvement of holographic trap positioning. The following paper: J. Mas, A. C. Richardson, S. N. S. Reihani, L. B. Oddershede, K. Berg-Sørensen,"Quantitative determination of optical trapping strength and viscoelastic moduli inside living cells," Phys. Biol. 10, 046006 (2013), which was recently accepted for publication, is now available on line. Josep is leaving us to join the Optical Manipulation Group at the University of Saint Andrews, Scotland. We wish you all the best! Aleix Llenas research collaboration comes to an end: in summer he will be within the Lighting group at the Catalonia Institute of Energy Research (IREC), He will be then doing the master in Photonics in Barcelona. See you soon! On June 11th Noemí Domínguez brilliantly defened her final Degree in Physics project, entitled "Construction of an Optical Trapping System". Well done Noe! You can now watch the new YouTube video to present the Master in Photonics. Arnau Farré and Ferran Marsà go to Madrid to start the Executive Master in Innovation, funded by the Inncorpora program. Dorian Treptow is visiting us for one week. Berta Gumí leaves us to collaborate with the Lighting group at the Catalonia Institute of Energy Research (IREC). Good luck! Aleix Llenas joins the group with a scholarship for research collaboration. He will be working on automatic trapping inside living cells. Frederic Català, who joined the group as an undergraduate student one year ago, is currently working in his master thesis project, related to beam steering accuracy in holographic optical tweezers. Since December 21st the group officially belongs to the Institute of Nanoscience and Nanotechnology of the Universitat de Barcelona. Selection procedures for the Erasmus Mundus Europhotonics Master 2013 edition are open (deadline for Master application, EU students: 1 February 2013). Mario Montes is at the 7th biennial workshop on Single Molecule Biophysics (SMB), held at Aspen, Colorado (6-12 January) to present our work "Intracellular force measurements with optical tweezers based on the momentum method". In the 1st Congress of the Spanish Network of Advanced Optical Microscopy (REMOA), held in Barcelona (20-22 November 2012), we have presented our work on optical manipulation inside living cells. We have attended the 5ª Jornada of the Institut de Nanociència i Nanotecnologia (IN2UB), held in Barcelona (15 November 2012). Last Wednesday (24-10-2012), Carol López brilliantly defended her PhD thesis, entitled "Manipulació òptica i seguiment amb precisió nanomètrica per estudis de transport en cèl·lules vives", before a committee composed by Prof. D. Ludevid (Centre de Recerca en Agrigenòmica), Prof. I. Juvells (Universitat de Barcelona) and Dr. J. Andilla (Institut de Ciències Fotòniques). Well done Carol and congratulations Dr. López! The EOS Annual Meeting is being held (25-28 September) at Aberdeen (Scotland), where the group is giving two oral presentations within the topical meeting "TOM 1 - Biophotonics: Optical Manipulation and OCT Imaging in Life Sciences and Medicine". We are fortunately not covered in foam... and, even better, Josep Mas has been awarded the EOS prize for the best student presentation (J. Mas, A. Farré, E. Martín-Badosa, and M. Montes-Usategui, "Optical force measurements in living A549 cells"). Congratulations! The company Impetux founded by members of the BiOPT group has been selected to represent the University of Barcelona in the international contest “Concurso RedEmprendia 2012: De la Universidad a la Empresa” organized by the university network RedEmprendia. Some members of our group are attending the X Reunión Nacional de Óptica (Zaragoza, Spain), a Spanish conference that gathers specialists in Optics together. At the conference, the manuscript "De un nuevo método para la medida de fuerzas con pinzas ópticas a la creación de la spin-off Impetux" (A. Farré, F. Marsà, M. Montes-Usategui) has been awarded with the PI/Micos prize to the best young contribution. E. Martín Badosa is now an editorial board member of Scientific Reports, a journal of the Nature publishing group launched in mid 2011. Berta Gumí joins the group to investigate and optimize the accuracy of our fluorescence imaging and tracking system. Prof. Igor Poberaj, from the University of Ljubljana, in Slovenia, will be giving a lecture entitled "APPLICATION OF LASER TWEEZERS IN ACTIVE MICRORHEOLOGY" on Wednesday, September 12th (Room 526, 10h30). Last Tuesday (03-07-2012), Arnau Farré brilliantly defended his PhD thesis, entitled "Momentum measurements of single-beam traps and quantitative holographic experiments: two sides of the same coin", before a committee composed by Prof. D. Petrov (ICREA and Institut de Ciències Fotòniques-ICFO), Prof. J. Campos (Universitat Autonòma de Barcelona) and Prof. S. Vallmitjana (Universitat de Barcelona). Well done Arnau and congratulations Dr. Farré! The results of the optical trapping survey are already available at the "Optical trapping park" site. The survey provides information on the optical trapping community, such as the background of the people working in the field or the main applications. We are pleased to announce that Arnau Farré will defense his PhD thesis, entilted "Momentum measurements of single-beam traps and quantitative holographic experiments: two sides of the same coin", next Tuesday, 3 July 2012, at 11.00am, in the Sala de Graus Eduard Fontseré of the Faculty of Physics. Please find the announcement here. Josep Mas has attended the "5th IBEC Symposium on Bioengineering and Nanomedicine" (11 June), where he presented the communication "Optical force measurements in living A549 cells". Our project Impetux has been selected to participate in the program "BioEmprenedor XXI" devoted to the creation of start-ups and organized by "la Caixa", Barcelona Activa, Biocat, Genoma España and "Cambra de Comerç de Barcelona". Our paper "Optimized back-focal-plane interferometry directly measures forces of optically trapped particles" has been published in Optics Express. Ferran Marsà is one of the winners of the award "Premi Jordi Porta i Jué" of the Catalan Physics Society (given to the best research works in Physics), for his Master thesis "Highly stable holographic dumbbell combined with accurate force measurements through back-focal-plane interferometry". Frederic Català joins the group as an undergraduate student and will be working on the use of holographic traps for precision experiments. Ione Verdeny has moved on to start a PhD in the Advance Fluorescence Imaging and Biophysics group, led by Melike Lakadamyali at the Institute of Photonic Sciences (ICFO). We wish you all the best, Ione! Our project: "Measurement of optical forces for manipulating samples" has been selected for a valorisation program in collaboration with the prestigious Business School EADA and coordinated by ACC1Ó. Selection procedures for the Europhotonics Master 2012 edition are open (deadline for Master application, EU and non-EU students: 1 February 2012). Josep Mas and Arnau Farré are attending the 1st Flash Talks Meeting (19 January, Faculty of Physics, Barcelona), which is a meeting to gather together all the students doing a PhD in Physics at the UB. They will give the short talks "Optical tweezers in living cells" and "Measuring light forces", respectively. Carol López has been hired at Cosingo (Imagine Optic Spain S.L.) as a R&D project manager. Congratulations, Carol, and good luck! Abstract: One of the tools for investigations of mechanical properties of single molecules or single organelles in living cells, or entire cells themselves is optical trapping. Under the right conditions of wavelength and intensity, optical trapping is non-invasive and cells survive in good condition. Quantitative mechanical measurements require knowledge of the force exerted by the optical trap, and precise tools of analysis for e.g. power spectral data. We discuss one procedure to extract the characteristics of the optical trap, and apply it in connection with trapping of lipid granules in live S. pombe cells. In addition, we also discuss the implications for the viscoelastic properties of the yeast cell cytoplasm. Some members of the group are attending the 2nd IRB Barcelona PhD Student Symposium: "Life in motion: dynamics of molecules and systems" (17-18 November, Barcelona). Title: Do biological cells care about physics? Abstract: While most current biological research focuses on molecular aspects of cells, we are interested in their global physical – mechanical and optical – properties. The mechanical properties of cells are largely determined by the cytoskeleton, an internal hybrid polymer network. This cytoskeleton evolves during the normal differentiation of cells, is involved in many cellular functions, and is characteristically altered in many diseases, including cancer. We can exploit the deformability of the cytoskeleton as a link between molecular structure and biological function to distinguish between different cells using a microfluidic optical stretcher. We find that optical deformability is sensitive enough to monitor the subtle changes during the progression of cells from normal to cancerous and even metastatic state. We can also distinguish stem cells from more differentiated cells. In both cases, their mechanical properties are tuned to the specific requirements imposed on the cells by physical constraints. Another example for the importance of physics are the optical properties of cells, specifically in the retina. We have recently shown that there are glial cells in the retina that act as optical fibers and that photoreceptor cells even invert their usual nuclear chromatin arrangement to turn them into microlenses. In both cases cells utilize physics in order to improve the light transmission through the retina and help to mitigate the disadvantage of its inverted structure. The paper Positional stability of holographic optical traps now available on line. The review paper Optical trapping: a review of essential concepts is available on line. The paper "Positional stability of holographic optical traps" has been accepted for publication in Opt. Express. Congratulations to Ferran Marsà and Dorian Treptow for defending their master thesis projects, "Highly stable holographic dumbbell combined with accurate force measurements through back-focal-plane interferometry" and "Video-based calibration of holographic optical traps", respectively (8 September, Master in Photonics). Mario Montes Usategui and Arnau Farré are attending the SPIE conference Optical Trapping and Optical Micromanipulation VIII (San Diego, 21-25 August). The review paper "Optical trapping: a review of essential concepts" has been accepted for publication in Opt. Pur. Apl. The paper "Adding functionalities to precomputed holograms with random mask multiplexing in holographic optical tweezers" has been selected in Virtual Journal for Biomedical Optics. A new patent application has been filed on May 16th: "Method for manipulating microscopic samples and measuring forces acting thereon", application no ES 201130783. Dorian Treptow joins the group as a Master in Photonics thesis student. He will be carrying a project on video-based calibration of holographic optical traps. Dr. Tomohiro Shima from the University of Tokyo is giving the lecture "Walking mechanism of cytoplasmic dynein". Yan Wang joins the group as a master thesis student, within the Erasmus Mundus master "Molecular nano- and bio-photonics for telecommunications and biotechnologies" (Monabiphot), of l'Ecole normale supérieure de Cachan. PostDoc call: we are seeking a candidate for submitting a proposal for a 3-year postdoctoral position, within the program Juan de la Cierva funded by the Ministry of Science and Innovation is Spain. Applicants should address a motivation letter and a full résumé, including contact details of two references, to Estela Martín Badosa before 31 January 2011. The paper "Adding functionalities to precomputed holograms with random mask multiplexing in holographic optical tweezers" has been accepted for publication in Applied Optics. Selection procedures for the Europhotonics Master 2011 edition are open (deadline for Master application, EU and non-EU students: Jan. 24th, 2011. The patent "Method and apparatus for measuring optical forces acting on a particle" (application ES200901259) is now available on line. Ferran Marsà joins the group as a Master in Photonics thesis student. He will be carrying a project on calibration of multiple holographic traps. Mario Montes participates in SECPhO (Southern European Cluster in Photonics and Optics) meeting on Thursday, 2 December, in which some members of the cluster are visiting our installations and are given a demonstration of our current research projects. 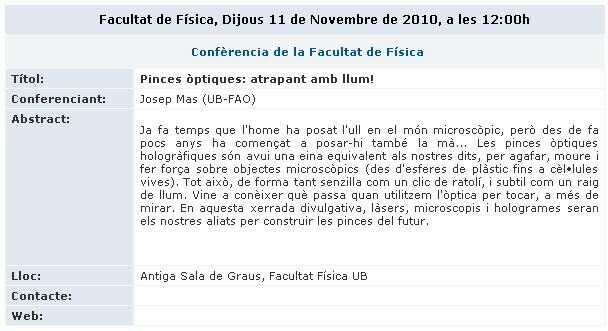 Josep Mas is giving the lecture "Optical tweezers: trapping with light" at the Faculty of Physics on Thursday, 11 November, at 12h. This talk is within the series "Encontres amb el Tercer Cicle", organized by PhD students to bring undergradate students closer to the research being carried out at the Faculty. Xavier Fernández joins the group as an undergraduate student, and will be carrying a project on automatic tracking and trapping of organelles within cells. We have been awarded with a grant from the Ministry of Science and Innovation in Spain for the next three years (see Funding section). Biophotonics - Advanced Trapping and Optofluidics in Life Sciences), held in Paris (26-29 October). We have been awarded a "Fons Prova de Concepte" grant by Fundació Bosch i Gimpera, within the Barcelona Knowledge Campus Initiative: Awarded Projects at the FBG website. With the funds, we will develop a new prototype of our optical tweezers force-measuring instrument together with Green Light Solutions, an optical engineering and consulting company based in Madrid. Congratulations to Ione Verdeny for defending her master thesis project "Analysis of neuroblastoma NG108 cells after optical tweezers laser exposure" (9 September, Master in Biophysics). The paper Holographic optical manipulation of motor-driven membranous structures in living NG-108 cells has been selected in Virtual Journal of Biological Physics Research. The conference to be given by Dr. Jochen Guck (University of Cambridge) on 8 September has been cancelled. Abstract: While most current biological research focuses on molecular aspects of cells, we are interested in their global physical – mechanical and optical – properties. The mechanical properties of cells are largely determined by the cytoskeleton, an internal hybrid polymer network. This cytoskeleton evolves during the normal differentiation of cells, is involved in many cellular functions, and is characteristically altered in many diseases, including cancer. We can exploit the deformability of the cytoskeleton as a link between molecular structure and biological function to distinguish between different cells using a microfluidic optical stretcher. We find that optical deformability is sensitive enough to monitor the subtle changes during the progression of cells from normal to cancerous and even metastatic state. We can also distinguish stem cells from more differentiated cells. In both cases, their mechanical properties are tuned to the specific requirements imposed on the cells by physical constraints. Another example for the importance of physics are the optical properties of cells, specifically in the retina. We have recently shown that there are glial cells in the retina that act as optical fibers and that photoreceptor cells even invert their usual nuclear chromatin arrangement to turn them into microlenses. In both cases cells utilize physics in order to improve the light transmission through the retina and help to mitigate the disadvantage of its inverted structure. The paper Holographic optical manipulation of motor-driven membranous structures in living NG-108 cells now published in Optical Engineering. Anne-Sophie Fontaine is attending the satellite symposium "Recent Progress in Cellular Imaging for Neuroscience Research" of the 7th International Congress of Neuroendocrinology (ICN 2010), 9-10 July, Rouen (France). She is presenting the talk "Optical Tweezers as a microtool in Neuroscience". The paper "A force detection technique for single-beam optical traps based on direct measurement of light momentum changes," is published in Optics Express. The paper "Holographic optical manipulation of motor-driven membranous structures in living NG-108 cells" is accepted in Optical Engineering. "Wavefront correction: Trapping through turbid media" News & Views is published in Nature Photonics. Josep Mas is leaving to spend 4 months at The Optical Tweezers Group of the Niels Bohr Institute (University of Copenhagen, Denmark), working in calibration methods inside living cells. The paper "A force detection technique for single-beam optical traps based on direct measurement of light momentum changes" is accepted in Optics Express. Arnau Farré and Josep Mas are attending Trends in Optical Micromanipulation II (11-16 April, Obergurgl, Austria). A. Farré is presenting the talk "Optical trapping Lab at the University of Barcelona (BiOPT): recent advances and future work" replacing E. Martín-Badosa. A new paper on education in optical trapping is accepted in IEEE Transactions on Education. The project has been carried out in collaboration with the Wavefront Engineering Research Group at the University of Barcelona. People say that Barcelona is a lovely place to live; a sunny city where you can enjoy the Mediterranean lifestyle. But... are you sure you want a post-doc position here? Mario Montes-Usategui has joined Dr. Hideo Higuchi's group at the University of Tokyo and will carry out a 6 months project on holographic tweezers.